Having a diaper bag is a MUST as soon as you leave the house with your baby. Even if you think it's just a quick outing, you will still need the necessities because you never know when a diaper change or bottle feed is required. A backpack is highly recommended to store all your baby stuffs because this way, you can have both your hands free to take care of your little one. Besides, all weight can be evenly distributed by the two straps onto your back ﻿﻿compare﻿﻿ to using the usual sling or hand-carry diaper bags which can get tiresome very quickly as your baby stuffs are not light. Now, ﻿you﻿ can certainly use an ordinary backpack for this purpose but what if we tell you there is a vast array of chic and stylish backpacks specially designed to function as a nappy bag? 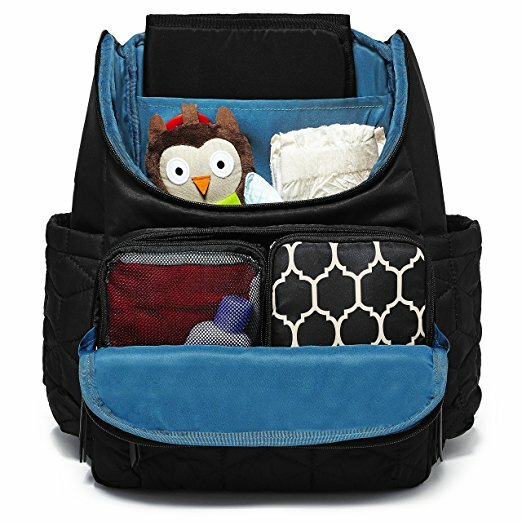 Most have a unisex design which makes it the perfect diaper bag for mom and dad. In fact, backpacks as such make for the best diaper bags for dads as most men are usually reluctant to carry around a typical diaper bag. 2. 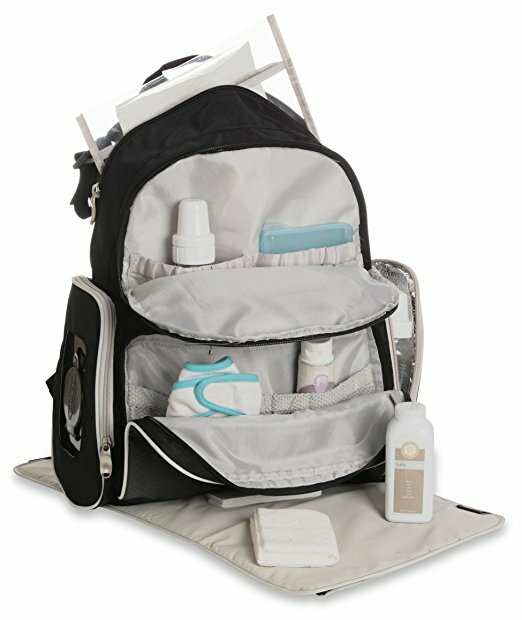 What to Look for to Find the Best Backpack for Diaper Bag? ​The Bag Nation Diaper Bag Backpack is hands down our favourite baby diaper bag backpack out of all that we reviewed. In a solid black colour with streamlined design, dads will happily carry it around without feeling embarassed. It is definitely the best diaper bag for dads all around! Made from high quality water resistant twill polyester which is stronger than cloth, the Bag Natio﻿﻿n has non-fraying stitches and strong zippers that can last even the toughest use. ​We know how ﻿﻿frustrating﻿﻿ it can be if zippers break easily, which seems to be a very common problem with diaper bags due to the usual heavy weight they were put through, so we are pleased to ascertain that these zips that are used on Bag Nation diaper backpacks are the real deal. We cannot go by reviewing this product without talking about the pockets that this backpack comes with - an astounding 14 pockets​! 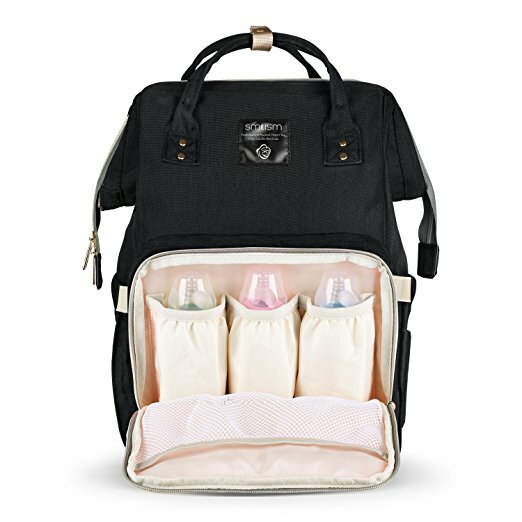 There is a compartment for simply everything, including an insulated pocket on the side for you to keep up to several bottles for any instant feeds. We ﻿especially ﻿love the tissue wipes compartment which you can insert your own soft packet wipes into it for easy dispensing. When you have everything properly compartmentalised, you can easily reach for the things you need without having to rummage through what seems like a bottomless pit hole for that one thing you are looking for. And this brings us to our next point - the design. We love how it is not too deep so that you can see what you have inside easily but still has enough space to store the bigger items. The way its opening is designed, which zips down at the back, makes it easy for you to retrieve things without having to remove the whole backpack from your shoulders . There is another ﻿compartment ﻿on the top which opens up easily and parents usually use it to store diapers for an easy reach.​ And the shoulder straps? We absolutely love how they are thickly padded that not only are they comfortable to the shoulders, but they lighten the load of your backpack as well when it is fully loaded. It also has integrated stroller straps that allows you to hang your backpack onto your stroller when you need to relieve your ﻿tired ﻿shoulders.​ The changing pad that comes with it is a pleasant surprise in terms of its high quality, as most changing pads that are included with other backpacks that we've reviewed are usually rather poor in quality that we will not recommend using them for your baby. In addition, it also comes with a zipped-up sundry bag which you can use to store your personal belongings, such as mobile phone, keys and some cash/cards. We know some ​parents even use it to ﻿store ﻿away soiled clothes or diapers, so as to keep everything else in the backpack clean and hygienic. 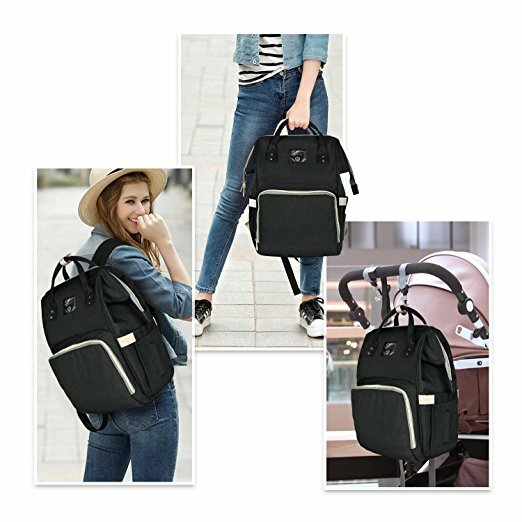 ​There is nothing much we can fault the Bag Nation Diaper Bag Backpack, not when it comes with LIFETIME WARRANTY and we can ensure you that it will last a very long use. You can even use it as a regular backpack once your baby grows up! Definitely the best diaper ﻿﻿backpack ﻿﻿for dad! 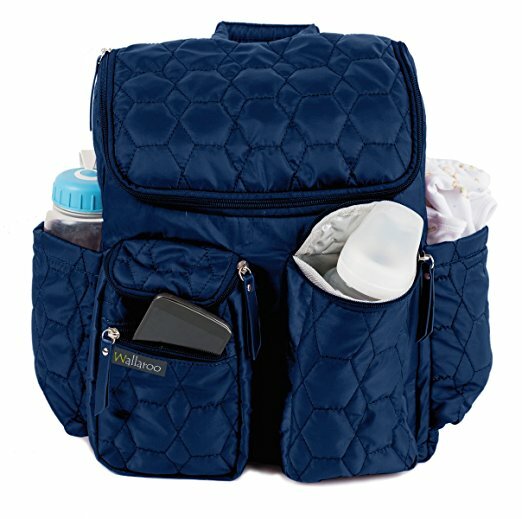 ​The Graco Gotham Smart Organizer System Back Pack Diaper Bag is another durable, high functioning diaper backpack. It may not have as many pockets as Bag Nation's, but the three main compartments that it comes with are definitely well thought out of to cover all that you need. Similarly, this backpack comes with a customized wipes dispenser compartment and has a removable changing pad, though the quality of it is not as high as Bag Nation's. Nonetheless, it does the job well if all you need is just an additional layer to lay your baby on. We love how both the straps are thickly padded for the ultimate comfort of parents, and not only that, even the tote handle​ is heavily padded as well so that you can carry it without having your skin digged on. ​The Smilism Diaper Bag Backpack is one of our top favourites simply because of its ergonomical design. First of all, it opens up like no other thanks to its zipper design. It opens up at the top to a wide opening which lets you see what's inside the bag in one glance WITHOUT the need of zipping it all the way down. We know how frustrating it can be sometimes when zippers go all the way down because this makes the content of your bag falls out easier. With this backpack, there is no such risk. Secondly, it comes with multiple pockets including insulated ones for you to compartmentalized your items in a neat and accessible way. We especially love how it has a back zip pocket to allow you to retrieve things without having to remove the whole backpack off your shoulders. In this pocket, it has another waterproof compartment for you to keep your wet diapers/clothes separated from the dry ones. Because of this function, a lot of cloth diaper users love this bag because​ they can keep their diapers hygienic. Due to the large capacity this bag has (although it may not look like it! )​, we think it makes for the best diaper bag for twins or two children with close age gap. It can fit so many things but still look slick without being bulky. And because of the multiple ways you can carry this backpack, it makes for the best convertible diaper bag as well! The Smilism diaper backpack is made from high quality, waterproof material for you to wipe clean easily. It also comes in 4 different colours so plenty of choices for those that do not like a plain black backpack! One thing to note though, this backpack is slightly on the heavy side because of the hardware it uses, but it is not too unbearable, in fact, you can be assured that the hardware used i.e. zippers are of high quality that can withstand even the roughest use. ​Here's another diaper bag for twins - the Wallaroo Diaper Bag Backpack. Available in 2 sizes - Medium and Large, both can easily fit enough supplies for two thanks to its 25 and 28 litres capacity respectively! ​Similar to Smilism, this backpack opens up wide on the top as well (though we prefer Smilism's slightly better because it has a wider opening which makes retrieving things that much slightly easier) with compartments inside for you to separate your belongings. There is also a compartment that is able to fit a 15" laptop or tablet if these are the gadgets you will be carrying with you all the time. 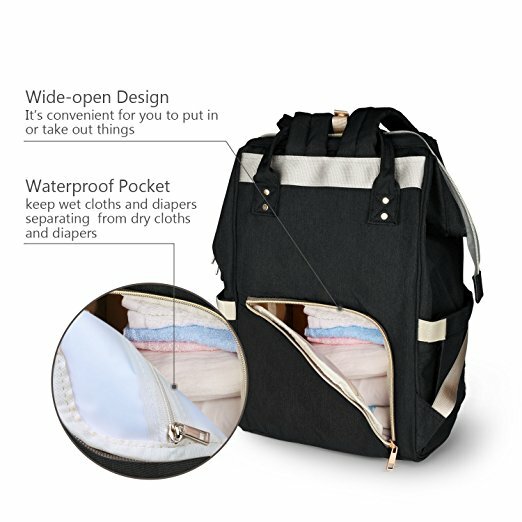 Apart from the usual changing pad which most backpacks will come with nowadays, the Wallaroo Diaper Backpack also comes with a diaper wet bag which makes it convenient to separate your wet diapers from the dry ones hygienically. One pleasant surprise ​is that the Wallaroo backpack comes with integrated stroller straps so that you can easily attach it to your stroller without much fuss. It is also made with durable high-tensile nylon stitching to endure tough and long-lasting uses. The The Skip ﻿﻿Hop Forma Pack and Go Diaper Backpack is a long time favourite of many parents, although we have to be honest here, we don't like it quite as much as the abovementioned three backpacks as we think are of a higher standard but with a cheaper price tag. The Skip Hop Forma has all that you need for a diaper bag, with compartments in the front and insulated pockets that are big enough to hold bigger bottles. This is something that we particularly like with this backpack because some may have insulated pockets that are a tad too small to fit bigger bottles. Apart from that, we also love how the changing pad pocket can hold tablets and laptops up to 15". This means you can keep your gadgets safely secured in a compartment without them moving around. 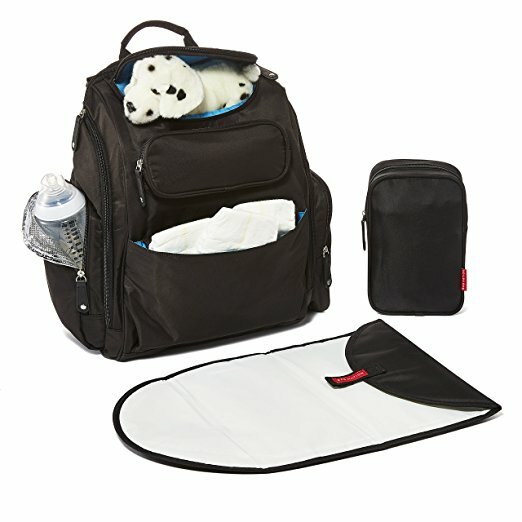 Again, we find that this is something not all diaper backpacks come with, although they can certainly fit in a laptop, there may not be a compartment to hold it in and keep it separated from other necessities, such as diapers. However, it is a pity that the S﻿﻿kip Hop Form﻿﻿a is not made from waterproof material which in our opinion, is almost a necessity because we all know things can get messy when baby is around. Being able to just wipe the bag clean when there's an accident makes life so much more convenient instead of having to chuck it in the washer or clean it separately when you get home. For a price point like that of the Skip Hop Forma, this is no doubt a disappointment. This﻿ is the first thing to look for - the more pockets/compartments there is, the better and more convenient it will make your life be. The reason is simple - with more pockets, you can compartmentalise your items in a neat and organized way so that you can easily find what you need in a jiffy. We know how urgent it can be sometimes when you need to find that particular one thing in your bag to pacify a crying baby! As we know, a diaper bag, be it in the form of a backpack or ﻿messenger﻿ bag, is usually considerably big in size so that it has the capacity to carry all your baby gears. So imagine the pain of having to rummage through that to find a particular item you need! So yes, make sure you look for one with lots of pockets - the Bag Nation is one that trumps in this category with its 14 pockets! For the same reason, a full diaper bag can be very heavy. If the shoulder straps are not padded, they can﻿ ﻿easily dig into your skin or worse, chaff your shoulders which can be painful and uncomfortable. A top rated backpack diaper bag, like those recommended above, will be equipped with plush padded straps for its carrier's ultimate comfort. To make it on the list of ﻿best﻿ diaper bag for travel, stroller straps are usually included. This is for you to hang your backpack onto your stroller for on-the-go convenience so that you can walk for hours without feeling the burden on your shoulders, which is what makes it the best backpack for mom on the go. 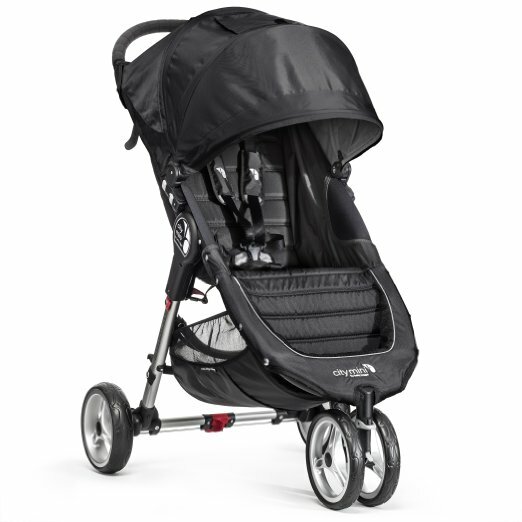 Such stroller straps usually come in a pair such as the Bag Nation and Wallaroo diaper bag, alternatively, some like the Smilism has rivet reinforced hand straps that can be hooked onto your stroller. Personally, we'd prefer the former integrated straps as we think it is slightly better in terms of balancing on a stroller. Now, these are not necessities, but we do think having a changing pad, insulated pockets and built-in baby wipes pocket included are major plus points that make for one best backpack for diaper stuff. With a changing pad provided like that of the Bag Nation and Graco Gotham, you do not need to buy a separate one to change baby's nappy while on the go. Insulated pockets as that provided by Skip Hop Forma﻿, in fact, most diaper bags come with this function, will keep bottles warm or cold for hours. You may not think a pocket specially designed to hold baby wipes is necessary, but until you've used one, you will not know just how much convenience and ease it brings you ﻿during those 'emergency moments'.﻿ You do not need to unzip or rummage through your bag to find the wipes but instead, you can simply grab a wipe from the dispensable pocket at the sides. Water resistant fabric material is ﻿the﻿ way to go so as to cater for accidental milk or water spillage when feeding baby. They are easy to wipe clean so ﻿that you can﻿ keep your bag in an always hygienic ﻿state﻿ given that it is used to store all your baby needs. The backpack should also feel sturdy to the hand and the zip not easily broken ﻿to ensure a long term use. This should be a no brainer, but you should be looking for ﻿one﻿ ﻿that has a ﻿large capacity so that you can fit in as much stuffs as you need. This is especially so if you are the proud parents of twins. Even though you may not fill it to the brim, it is always better to have more capacity. The good ones will be able to fit a lot but still look sleek without being bulky. Another thing to look for is the design of the backpack. And we don't mean from a stylish point of view, rather, it is the functionality that should be paid attention to. A top rated diaper bag backpack should have a big opening so that you can see and retrieve everything inside easily. The Smilism is the best in terms of this as it opens up wide without risking the contents from spilling out from the sides. Having an opening at the back of the bag is another plus point as you won't need to remove the whole backpack off your shoulders to retrieve things. 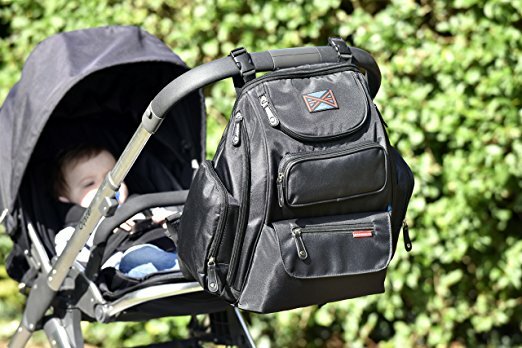 This is mentioned throughout this review here above, but one major reason we love a backpack as﻿ ﻿a diaper bag is that it is usually easier to organize compare to the traditional sling or hand carry ones with the many different compartments and zip up pockets it comes with. It is also awesome to have both your hands free, and you don't have to leave it on the ground if say, you have to utilize a not-so-clean public toilet. But above all, the best reason is that a backpack make for the best mens diaper bag! Most men, if not all, are reluctant to carry the traditional diaper bags which usually ﻿come in ﻿colourful﻿ or flowery patterns, and we can't totally blame them! With the sleek, streamlined design that these diaper bag backpacks come in, they make for the best unisex diaper bags, giving no excuse for men NOT to carry the diaper bag anymore! Also, backpacks are generally bigger in size making them perfect as big diaper bags for twins. And last but not least, backpacks are generally better for your back as the weight of its content is evenly distributed to both shoulders, rather than having them burdened one shoulder (think sling messenger-style diaper bags). 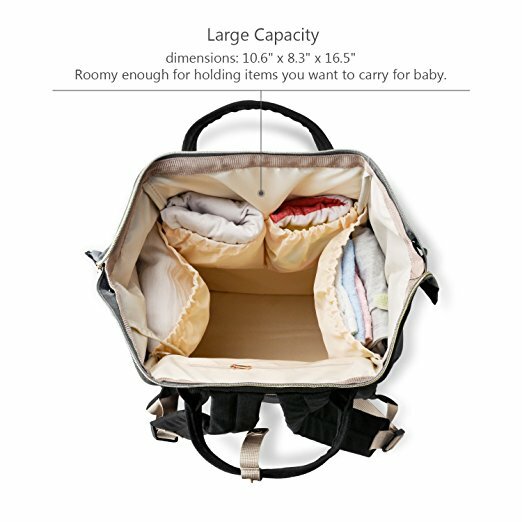 For those that want to get the most out of it, you can even continue using it as an ordinary backpack when baby outgrows its usage!